The PSI Official Rectangle Notary stamp is the perfect stamp for notary publics who struggle fitting their seal on to their documents. This pre-inked stamp allows for a stunning imprint every time with gentle pressure to the top of the stamp. Our PSI Official Notary Stamp is made with 40% recycled plastic and is eco-friendly and durable. Your stamp is guaranteed to meet all state board specifications and arrive to you in a timely manner with our fast turnaround times. This high performance PSI Pre-Inked Rectangle Notary Stamp is a must-have tool for those notaries who struggle with finding space for their seal on crowded documents. Designed to fit within the finest margins of documents, this Pre-Inked stamp will not disappoint and is sure to please any client. 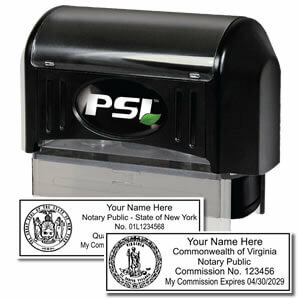 This PSI Official Rectangle Notary Stamp comes standard with your state seal per your state specifications. WHAT MAKES ME OFFICIAL AS A NOTARY PUBLIC? Above all else, a notary public is expected to produce and seal a document with their personalized stamp or embosser with the addition of their signature. Your signature on a document alone will not make authenticate the document. It is important to make sure your seal is professional-looking and legible. Sometimes, as a notary public, you find heavily worded documents with little room to place your official seal. With the PSI Pre-Inked Rectangle Notary Stamp, all you need is room in the margins. Simply push down your stamp and receive a crisp and clean impression. Follow up with all other state specified requirements and you are good to go!